C of some aspect of operations, and then applying changes intended to improve that performance. It is a criti- cal component in maintaining the health of any operation and can be applied to almost any activity. This is the third and ? nal installment in a series of articles intended to introduce CI, and to give some practical tips for using CI in any maritime organization to improve train- ing effectiveness and ef? ciency. 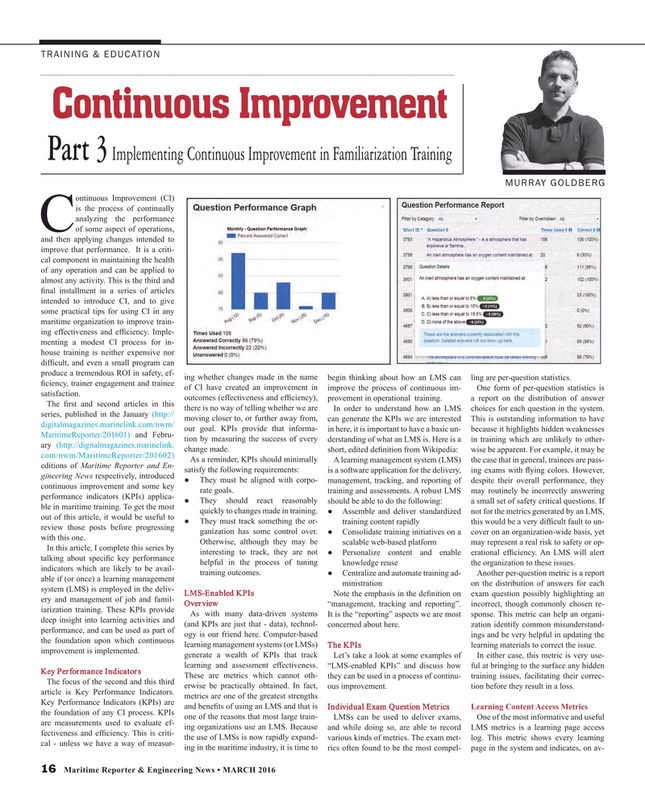 Imple- menting a modest CI process for in- house training is neither expensive nor dif? cult, and even a small program can produce a tremendous ROI in safety, ef- ing whether changes made in the name begin thinking about how an LMS can ling are per-question statistics. ? ciency, trainer engagement and trainee of CI have created an improvement in improve the process of continuous im- One form of per-question statistics is satisfaction. MaritimeReporter/201601) and Febru- tion by measuring the success of every derstanding of what an LMS is. Here is a in training which are unlikely to other- ary (http://digitalmagazines.marinelink. As a reminder, KPIs should minimally A learning management system (LMS) the case that in general, trainees are pass- editions of Maritime Reporter and En- satisfy the following requirements: is a software application for the delivery, ing exams with ? ying colors. However, gineering News respectively, introduced ? They must be aligned with corpo- management, tracking, and reporting of despite their overall performance, they continuous improvement and some key rate goals. training and assessments. A robust LMS may routinely be incorrectly answering performance indicators (KPIs) applica- ? They should react reasonably should be able to do the following: a small set of safety critical questions. If ble in maritime training. To get the most quickly to changes made in training. ? Assemble and deliver standardized not for the metrics generated by an LMS, out of this article, it would be useful to ? They must track something the or- training content rapidly this would be a very dif? cult fault to un- review those posts before progressing ganization has some control over. ? Consolidate training initiatives on a cover on an organization-wide basis, yet with this one. In this article, I complete this series by interesting to track, they are not ? Personalize content and enable erational ef? ciency. An LMS will alert talking about speci? c key performance helpful in the process of tuning knowledge reuse the organization to these issues. As with many data-driven systems It is the “reporting” aspects we are most sponse. This metric can help an organi- deep insight into learning activities and (and KPIs are just that - data), technol- concerned about here. zation identify common misunderstand- performance, and can be used as part of ogy is our friend here. Computer-based ings and be very helpful in updating the the foundation upon which continuous learning management systems (or LMSs) The KPIs learning materials to correct the issue. The focus of the second and this third erwise be practically obtained. In fact, ous improvement. tion before they result in a loss.